Our HOME is a Veterans organization out of Monroe, LA who helps soldiers transition back to civilian life by connecting them with employment and housing opportunities, assisting with VA paperwork, and offering a support system to Veterans and their families. Because PTSD is the biggest threat to Veterans and their families, having proper medical care and a support system is vital. Many organizations say they help Veterans, but Our HOME stood out to us because they told us exactly how they help Veterans. This tour will help them expand their network and share knowledge with other Veteran organizations, and also reach transitioning Veterans who have not yet connected with their community. The Veterans of Comedy are a troupe of Veterans who are also comedians. Our mission is to assist in community bonding by providing laughter. Everyone knows laughter is the best medicine, right? Our headliner, Will C, has countless TV and movie credits, including Modern Family, Gene Simmons Family Jewels, Gone Girl, Storage Hunters, Hail Caesar, and many many more. Featuring for us is Brad Ellis, who was a Marine, then a police officer, and is now a comedian. Dakoda Potter, our host, was a grunt in the Army and is now our comedy grunt. Just kidding! He's new to comedy, but is quickly rising in popularity and demand. Joining us is Special Guest, Reno Collier, from the Blue Collar Comedy Tour: the Next Generation. Reno Collier: A former P.E. teacher, West Virginia native Reno Collier has endeared himself to a wide range of audiences from college students to church softball teams. With a contagious laugh and friendly, almost intoxicating demeanor, Reno's observations often find him recalling mishaps of his West Virginia cousins, his Scottish heritage, unruly in-laws and alien abductions. Reno's journey began at the Punchline Comedy Club in Atlanta, GA where he tended bar to supplement his day job. One night he found himself on stage during the weekly open mic night. His unique outlook on life - mixed with a six-pack - was instantly popular and provided a platform to launch a career as a comedian. Reno has built a reputation by selling out comedy clubs and colleges nationwide. In 2004 he joined Larry The Cable Guy on the hugely successful "2004 Tour of America". Reno's other national tours look more like a comedian's wish list than a resume, including theater and arena tours with the legendary Jeff Foxworthy, Bill Engvall and Ron White. In January 2007, he re-joined Larry The Cable Guy for his wildly successful arena tour currently spanning the United States and Canada. Reno's past TV credits include NBC's "Late Friday", "Politically Incorrect with Bill Maher", "The Martin Short Show", VH-1's "The List", and Comedy Central's "Premium Blend". 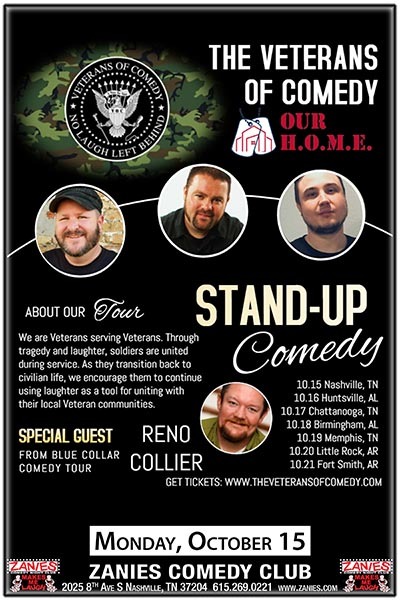 In 2005 and 2006, Reno headlined the "Comics on Duty" tour for American troops stationed in Iraq. He is a regular fixture on the Bob & Tom syndicated radio show and Country Music Television (CMT), hosting various specials for the network. He has performed at the prestigious HBO Comedy Arts Festival in Aspen, CO and the Montreal Comedy Festival, and in 2005, taped his own "Comedy Central Presents" half-hour special. He can currently be heard during his weekly call-ins to the Blue Collar Comedy Channel on Sirius Satellite Radio.